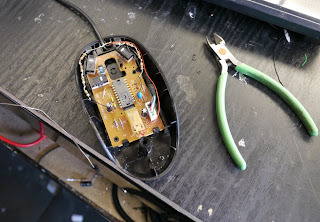 I modified my standard, cheap Logitech optical mouse to include a small heating element. This really helps out on those cold nights when I am too cheap (or energy-conscious) to turn up the thermostat. I opened the mouse, and located ground and +5V locations on the circuit board. I added two strings of 1/4w resistors that each have 4 10-ohm resistors in series. Each string is 40 ohms, so at 5V, this comes out to 5/40 = .125A or .625 W. The total heating power is 1.25 watt, and the total current (250mA) is well below the 500mA limit for each USB port. A steadicam is a device that is built to reduce the camera shaking and rotation that is associated with hand-holding a video (or film) camera. Everyone has seen the Blair Witch style footage where the camera is bouncing around and being shaken to death by the person holding it. Even the most trained camera operators cannot hand-hold a camera and walk without the footage showing some shaking. The steadicam greatly reduces the amount of shaking and provides much smoother footage. 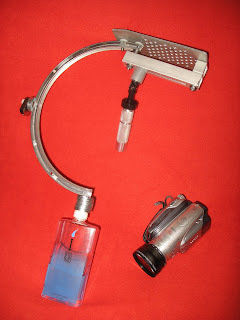 The water bottle on the bottom of the stabilizer can be filled and emptied to adjust the amount of mass at the lowest point of the system. Ultimately, it may be best to replace the mass with metal (washers or similar), but the water is great for adjustment and testing. The gimbal joint is a Traxxas 4949 "half-shaft" for large RC cars. I have two radial ball bearings inside the handle -- these are similar to skateboard bearings in size and quality. The aluminum plate is 1/8" thick and I drilled it to accommodate different camera mount positions. The aluminum square tube is 1/8" thick 1"x1" with a slot cut lengthwise along the bottom for balance adjustment. The curved piece of metal is a large sector from a lazy susan bearing (aluminum). The handle was made from 1" aluminum bar stock. Instead of drilling a bunch of holes in the top plate, it would be better to cut a series of horizontal slots. I found out that the side-to-side balance is critical and having a slot would allow much finer control than jumping to the next hole. The front-to-back balance can be adjusted via the slot in the aluminum square tube, so it will be fine to move from one horizontal slot to the next in the top plate as long as fine horizontal adjustment is attainable. The friction of the bearings and gimbal must be as absolutely low as possible. The traxxas gimbal has 3mm pins, and the corresponding holes in the plastic gimbal parts are a little tight. I happened to have a reamer of just the right size to loosen the fit. In its original form, the tight-fitting pin will transfer too much motion to the camera. Likewise, the ball bearings in the handle must be super low-friction. Using sealed bearings will probably not work because the rubber seal will create too much friction. 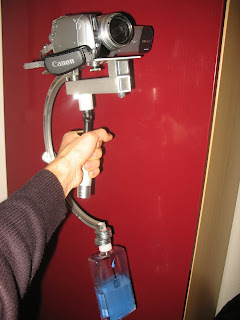 If I were building another steadicam, I would focus even more on getting a super low-friction bearing system. I might try experimenting with making a longer balancing arm. If the lower mass hangs further below the pivot, less mass will be needed, and the longer pendulum will favor slower oscillations. It seems like win-win, but the device may be more difficult to carry and use. Panning control should not be ignored. I found myself gripping the traxxas shaft with my finger tips to control the camera pan, and this worked pretty well. Adding a knurled wheel might be nice.